Holding a bouquet of beautiful autumn foliage, a young lady pauses in half-step to look up at the tree branches above. She has a dreamy expression and a gentle smile at the sight of a magnificent array of colors splashed across the night sky. 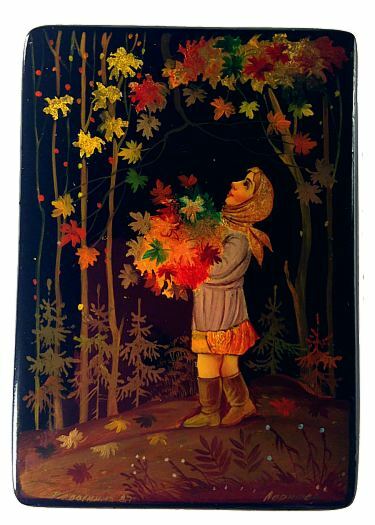 The scarf wrapped around the girl's head and her skirt aid the dominance of golden yellow in this fall composition. The contrast of iridescent colors against the black background create a very fresh, crisp look. A lovely little box painted by Larishev of a famous artist family in Fedoskino. 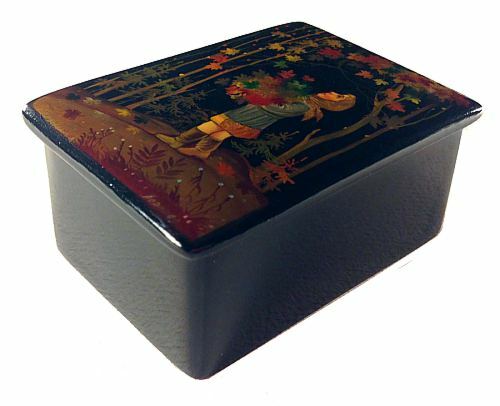 The box is made from papier mache, sits flat with no legs, and has a hinge on the left. The interior is red. The bottom of the painting is signed with the name of the artist, village, and year. "Made in USSR" is written on the bottom of the box. Box and lacquer are in excellent condition.